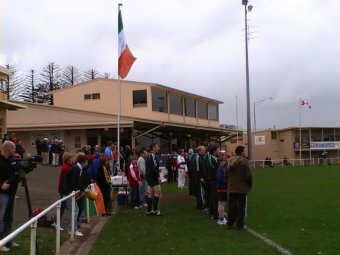 The fourth series of matches in the 2008 International Cup, currently in Warrnambool, sees teams that finished in the same position in their respective pools taking each other on (e.g. fourth in Pool A plays fourth in Pool B). This means there should be some very evenly matched sides playing off, building towards the semi-finals in the evening that will determine which two nations head to the MCG on Friday for the IC08 Grand Final. The good news is that the weather for the first round finals, on Wednesday 3rd September, is predicted to be fine and 14 degrees, and if the wind stays down that would make it much warmer than for the games last Monday. The bad news is that the overnight minimum is forecast as zero degrees Celsius, and with matches scheduled at 5:30 and 7:30pm, players and spectators will definitely be feeling it. This match was eagerly anticipated by International Cup watchers. Could the improving Lions take it up to the bigger bodied and more experienced Revolution? The weather while still quite windy across the ground and favouring the southern end had improved since the earlier session with the sun now shining and the ground dried by the constant wind. The Lions set the tone with the first clearance. Steven Malinga snapped out of the pack to open the scoring with a point. Simphiwe Mbhalo added another from a long kick that drifted away and Bayanda Sobetwa snapped one more after roving a loose ball. The US team started to look a little more settled and laying some strong tackles. But the Lions put up the first goal of the day and the only one for the quarter when Malinga marked a kick in from an out of bounds free kick, went back and goalled. Donnie Lucero cleared from the centre of the ground to Justin Valley for the US, but the ball spilled and though he gathered was tackled as he kicked with the ball skewing left for a behind. South Africa added another point after Sobweta's long bomb came off hands for a minor score. Further points were added for the Lions by Mtutuzeli Hlomela, Toy Prinsloo and Richard Prinsloo. The Lions 1.8 to the US 0.1 with a wind advantage of a couple of goals looked like a poor return but it was a lead that they were glad to have. Sweden and Finland continued their countries' long running sporting rivalry and so far short running footy rivalry at the other end of the world in Warrnambool. The more experienced Swedes kicked with the wind in the first quarter. Finland were competitive at ground level but unable to get too much going into the wind as Sweden added 2.4 with the wind affecting goal kicking that could have seen the lead being much larger. Roger Nillson was aggressive at the ball and 18 year old Emil Aberg racked up possessions. Fernando Leon was the standout for the Finns. A cold Warrnambool morning kicked off with the New Zealander’s Haka and the Samoan Siva Tau going head to head as the local media (and a large group of school children) lapped it all up. At the last International Cup the two almost came to blows at the end of the ceremonial shows of force but everyone went their own way peacefully this time at Walter Oval. After the Monday round 3 games International Cup players headed to Warrnambool's Brauer College where the vast gym room hosted a relaxed evening of complimentary finger-food, drinks, music, a bit of dancing, and performances by some of the teams. 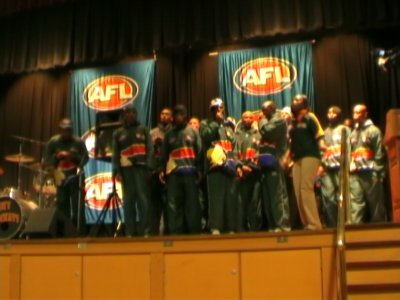 In much the same style of an evening in Wangaratta when the Cup went there in 2005, speeches were kept to a minimum, with the AFL's Kevin Sheehan doing the basic introductions. The local rockabilly band The Sky Rockats played a few songs (with the unstoppable ground announcer Grilla joining in) and several nations also sang - the Indians gave their rendition of a Bollywood hit, the Americans, unusually self-conscious, sang "You've lost that loving feeling" and the Kiwis started with a gay Austrian impersonation (I'm not sure why) followed by the theme song to popular Aussie soap-opera Home and Away, but couldn't escape before acceding to crowd demands for the Haka. Japan were all energy as they belted out a tune (using the term lightly) and the Irish were deep and strong but didn't burst into any Riverdancing, though at least one began to strike the pose - more threat than intention. The Our Airline Nauru Chiefs have faced some major obstacles over the last few years and just making it to the third of the AFL's International Cups has been an achievement in itself. So it's quite remarkable that after such an effort, including personal self-sacrifice, that coach Wes Illig (pictured with Dipper) still found time to have some empathy for his opposition. As with all the Peace Team's matches against the more experienced international sides, this was never going to be a close match. So coach Illig obviously asked himself, "what are we going to get out of this match?" But he also asked "what will they get out of it?". His decision was to try to teach his own men to have some understanding of their opponents, and to over an olive branch the Palestinian and Israeli players. Prior to the match he suggested that the two sides warm up together, and that was gratefully accepted by coaches Robert DiPierdomenico (the famous former Hawthorn champ that you'll see the media swarm to) and Simon Jacobs (the quiet but just as important one in the background). Fresh from a stirring victory over Samoa, next stop was the newest faces in International Cup footy, India. Given Japan is doing relatively well at this tournament there was little chance the Indians would cause them too many difficulties, and that is how it turned out. Played on Monday 1st September at 1pm on Mack Oval, the wind-swept ground didn't lend itself to good football. There's no doubt the Japanese coaching staff were frustrated by the fumbling football on display, as the wind made precision kicking - so important to Japan's game plan - a very difficult task, even over short distances. Given the good sized oval being played on, that meant India had ample opportunities to take the ball from the Japanese, and that they did. In fact India had periods where they had plenty of the ball, but the long journey to goal against good opposition was beyond them at this early stage of their football development. Both teams seemed to get lost out wide. The 1pm Monday slot at Walter Oval in Warrnambool pitted one of the tournament favourites Papua New Guinea against a British Bulldog side hurting from an unexpected loss to Nauru. A big question was whether the Brits would mentally recover from their loss to give a good account of themselves in this match. After a shaky start and wearing their predominantly white "away" strip, the answer was yes, as they attacked the contest with renewed vigour in conditions that probably suited them. The strong wind made for some ugly footy which limited the clean passing of PNG's running game. Having said that, it also meant any possible aerial superiority for Britain was extinguished. Unfortunately that Bulldog spirit took a while to get started, and kicking with a very strong wind the Papuans effectively ended the contest in the first quarter, booting 4.4 (28) to zip. If the Poms had won the toss then perhaps they could have scored a few goals themselves and put some pressure on the Mozzies, but it was not to be. In one of Round 3's crucial matches for determining who would go through to the semi-finals of the International Cup, Ireland's Warriors jumped Canada early and steadfastly hung on for the rest of the match in an impressive display of defensive football. 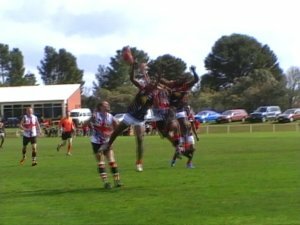 The Monday match started at 11am and the Northwind kicked into the northerly wind blowing pretty strongly to the south end of the ground in the first quarter. The Canadians have looked impressive so far and this was their chance to step up into the top four. But Ireland had most of the play early and looked much more intense. They peppered the goals, racking up a healthy first quarter score of 2.2 (14) and holding the Canadians to nothing, before a crowd of perhaps 200, with school children arriving and cars starting to surround the oval in traditional country style. With the pool rounds completed, the final draw for Wednesday is ready to go. Ireland, New Zealand, South Africa and PNG are the four left with a shot at the Cup, with some of the newer countries undoubtedly looking forward to getting a few goals on the board against fellow newcomers. Note the later starting times, with the play-offs for a spot in the game at the MCG to be held under lights - hopefully with a big crowd of eager country footy fans from Warrnambool and surrounds. Placement finals will be played at Royal North on Friday. The intention is to update these scores each quarter as the games progress. Match reports and images will follow later. All times are Australian Eastern Standard Time (AEST), which is +10 GMT. A cold day, around 14 degrees Celsius, with showers increasing. An unlikely sequence of results in the final round of the 2008 Australian Football League season has resulted in a first round finals draw that does not feature any match in Melbourne on Saturday. 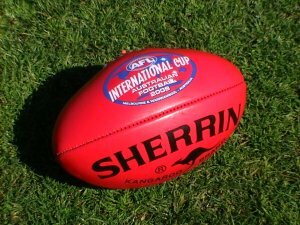 This upsets the AFL's plans to stage the International Cup Grand Final as a curtain raiser to such a final at the MCG - the match was always expected to occur then, but was subject to the clause "to be confirmed". Fortunately the Second Qualifying Final between Hawthorn and Western Bulldogs is set down for the MCG from 7.50pm on the Friday, 5th September. 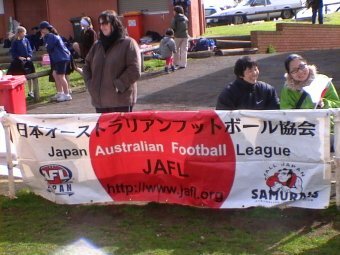 Preliminary confirmation from the AFL is that the International Cup match will therefore be a curtain raiser to this match. More details when available.